Eclipse sensiNact (lower-case on the first s and capital letter on the second N) aims at creating a common environment in which heterogeneous devices can exchange information and interact among each other in the IoT world. Eclipse sensiNact is composed of two tools, sensiNact Gateway aiming at integrating devices and aggregating data from various sources and sensiNact Studio aiming at interacting with the sensiNact Gateway to visualize the devices and the data. 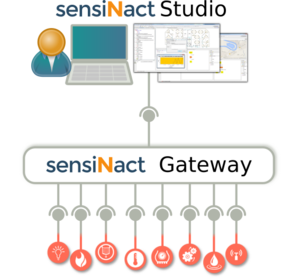 sensiNact Gateway interconnects IoT devices using different southbound IoT protocols such as Zigbee, EnOcean, LoRa, XBee, MQTT, XMPP, as well as platforms such as FIWARE and allows access to them with various northbound protocols such as HTTP REST, MQTT, XMPP, JSON RPC and CDMI. The gateway can also host applications and manage them using an application manager module. sensiNact Studio proposes an IDE (Integrated Development Environment) based on Eclipse to manage the existing devices, in addition to develop, deploy and manage IoT applications. This page was last modified 09:27, 12 September 2018 by Etienne Gandrille. Based on work by Jander Nascimento and Remi Druilhe.